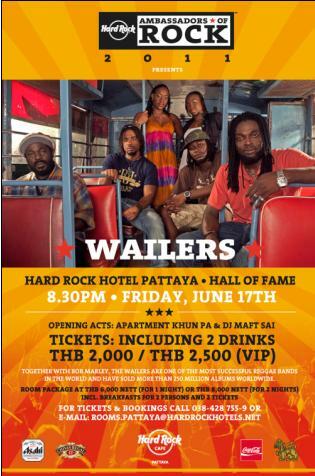 As part of Hard Rock’s Ambassadors of Rock Tour and in celebration of Founders’ Day, this year marking the 40th Anniversary of Hard Rock, we are proud to present an ONE-NIGHT-ONLY, special performance by the legendary reggae band, WAILERS, on Friday 17th June 2011 at Hard Rock Hotel Pattaya. The Wailers are best known for their invigorating, energizing music and hits, including “Get Up Stand Up,” “I Shot the Sheriff, ” “No Woman No Cry,” “Buffalo Soldier,” and countless more. Together with Bob Marley, they are one of the most successful reggae bands in the world and have sold more than 250 million albums worldwide. The band has produced more than 20 chart hits, including seven Top 10 singles. Outside of The WAILERS’ groundbreaking work with Marley, the band has also played or performed with international acts like Sting, Stevie Wonder, Carlos Santana and Alpha Blondy, as well as reggae legends, such as Peter Tosh, Bunny Wailer and Burning Spear. The WAILERS have also toured the globe, playing to an estimated 24 million people, from the U.K. to Africa and the Far East. Tickets are available at THB 2,000 net and THB 2,500 net (VIP area) inclusive of 2 drinks. We also offer a special room package inclusive of breakfast for 2 persons and 2 tickets at THB 6,000 net (1 night) or THB 8,000 net (2 nights). The opening act on the night will be Thai band Apartment Khun Pa, themselves with a huge following in Thailand, playing live from 9pm. It will all kick off with cult Thai DJ Maft Sai, spinning his selection of roots, funk and the most infectious Luktung, from 8.30pm.